For every healthy person who becomes over-weight, an over-weight person graduates into obesity. From there, the productivity rate begins to drop and the sick days rise. When you're obese, you're chances of being ill are higher than you're co-worker who maintains a healthy body weight. 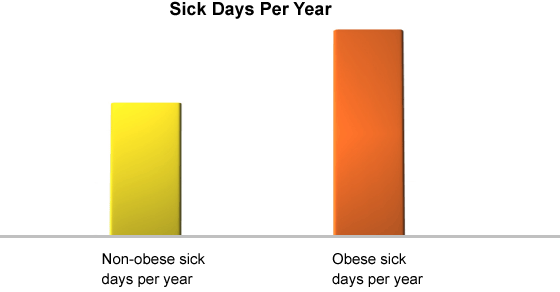 The most obese men take 5.9 more sick days a year; the most obese women, 9.4 more days. When sick days are not an issue (presenteeism), the obese lose one month of productivity per year in comparison to those with a healthy BMI. This could be due to work obstacles such as fatigue, shortness of breath, mental fog, chronic pain and discomfort, and an overall lack of endurance. This seems to show up in the wages as well as the obese are less likely to be hired than their leaner peers. An obese women earns about 11% less than women of healthy weight. There's also the cost of healthcare and medical bills. Wages drop but expenses rise. In comparison, the sick days and medical expenses of smokers also tends to be high, but their lifespans tend to be shorter. Modern medicine is keeping the obese alive longer (which is a good thing) but makes the accumulation of medical expense in old age astronomical. Obesity is not just an issue as far as aesthetics or even health. It's possibly a bigger productivity and financial issue. If how you look doesn't drive you (for many it doesn't), then maybe your pocket book or the loss of time will. The same issues can arise for people who don't show the outward symptoms of obesity but lack in robustness and overall well-being. Really this applies to anyone who is "sickly" or has a weaker constitution. The obese just tend to be easier to spot.